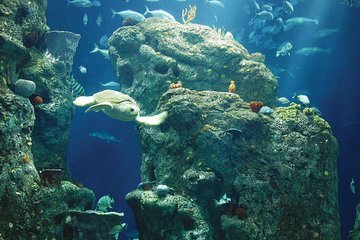 At the South Carolina Aquarium, located in downtown Charleston, exchange your voucher for an admission ticket and begin exploring. Peruse the nine distinct galleries, which feature more than 7,000 aquatic animals in 60+ exhibits. Take an imaginary journey from South Carolina's mountains to its seaside, encountering animals such as pythons, seahorses, great blue herons, albino alligators and bald eagles. Come face-to-face with sick and injured sea turtles in rehabilitation at our newest addition, Zucker Family Sea Turtle Recovery, and follow their journeys from rescue to rehab to release. Marvel at the 385,000-gallon Great Ocean Tank, a 2-level aquarium featuring sharks, turtles and fish. Children love the Touch Tank, where they can gently touch horseshoe crabs, stingrays and other species while learning about them from aquarium staff and learn fascinating details about the natural world at daily dive shows and animal encounters. Discover the wonder of water, wildlife and wild places at the South Carolina Aquarium. Great Aquarium, but arrive EARLY as the place becomes unbearably crowded. This was a great experience. We even got a behind the scenes tour of the top of the tank. Meeting one of the divers and learning how they feed the big turtle and sharks was informative. A little later we were treated to Santa diver explaining more information about the animals in the tank. All of the volunteers were knowledgeable and friendly. Petting the stingrays in the touch tank is enjoyable for anyone whom likes marine life. Also, if you visit this aquarium, please be sure to book an excursion to the sea turtle hospital. It is amazing and well worth the 10 per person. It was nice if you have not been to too many aquariums. It was not as good as several others we have been to. We go go every aquarium at every city we visit, if there is one. For us it was a bit boring. Kids were thrilled. However, we were expecting to see bigger sharks. A beautiful aquarium. Lot's of great, active sea life! !